For the very latest William Bennett Modern news follow us on facebook where we post our most recent deals and acquisitions. 06.09.14 | We have recently consigned an important private collection of Salvador Dalí bronze sculptures, including Alice in Wonderland, Lady Godova with Butterflies, Persistance of Memory, Space Elephant, St. George and the Dragon, as well as other rare and much sought after Dali sculptures. The collection is priced well below market values by a motivated seller. 06.02.14 | For our exhibition Salvador Dalí: Surrealism and Beyond, we have acquired some of the most rare Dalí signed prints from such portfolios as The Hippies, Memories of Surrealism, The Florals, and other individual editions. 05.20.14 | As part of our upcoming exhibition Salvador Dalí: Surrealism and Beyond, we present Dalí's Alice In Wonderland Bronze Sculpture from 1980. Part of an important private collection of rare Dali sculptures consigned for the exhibition and available now! 04.28.14 | The Andy Warhol market continues to skyrocket! This past weekend at Christies Shanghai a standard edition Flower #68 sold for $54,519. Our example is a more rare signed Artist Proof from an edition of only 26, priced well below the auction results. a stunning original hand signed lithograph from 1975. 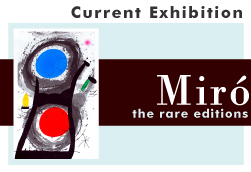 03.21.14 | We invite you to preview our latest exhibition Joan Miró: The Rare Editions featuring a collection of large scale Etchings Aquatints and Carborundums as well as selection of other works spanning the artist's 60 plus year career as a printmaker. 03.07.14 | We have recently consigned an important collection of Andy Warhol prints, including a rare Artist's Proof Flower #68 as well as one of the original 1964 Flower #6 hand signed Leo Castelli Gallery Invitations to the Monumental Flower Painting exhibition. 02.08.14 | Wow! Salvador Dali's Alice in Wonderland portfolio available complete for only $12,500 or individually starting at $1,500. One of the rarest and most sought-after Dali suites. Published by Maecenas Press-Random House, New York in 1969, the suite contains 12 heliogravures - one for each chapter of the book - and an original hand signed etching in 4 colors as the frontispiece. 02.04.14 | Rare Andy Warhol Flower exceptionally priced and available now! This Flower (FSII 68) is a hand signed Artist Proof, 1 of only 26 made and is in perfect condition. A screen print from 1970, one of Andy Warhol’s most popular and iconic series, a favorite among Andy Warhol collectors. 01.06.14 | Happy New Year from everyone at William Bennett Modern. To celebrate we are offering an exciting collecting opportunity - any two works from Dali's Divine Comedy for only $2014 - including framing and US shipping, a savings of almost 40% off gallery pricing. For this special offering we have acquired a beautiful, complete example of the French edition illustrated here. Woodblocks from the scarce German edition of only 365 examples featuring Dali's engraved signature are available for a slight premium. 12.15.13 | We are thrilled to present an exclusive collection of new paintings by contemporary NYC artist Chrissy Angliker. 06.15.13 | Thank you to all our collectors and visitors for making our first artMRKT Hamptons a success. 05.12.13 | William Bennett Modern is honored introduce the works of Frances Kornbluth to our collectors. The Fairy Tales of Hans Christian Andersen. These delightful works are currently available for purchase. 02.01.13 | William Bennett Modern is pleased to announce our newest exhibition Picasso and Miro: Master Printmakers.